ENO is one of the most popular hammock brands seen on the trail. In my post, 10 Gear Tips for Couples (& Partners), I had mentioned a double person hammock and really couldn’t get the idea out of my head ever since. All the hammock users I saw while hiking the trail in 2013 were solo hikers. I loved the idea of changing up the average couple’s shelter to a double person hammock instead of a two person tent. 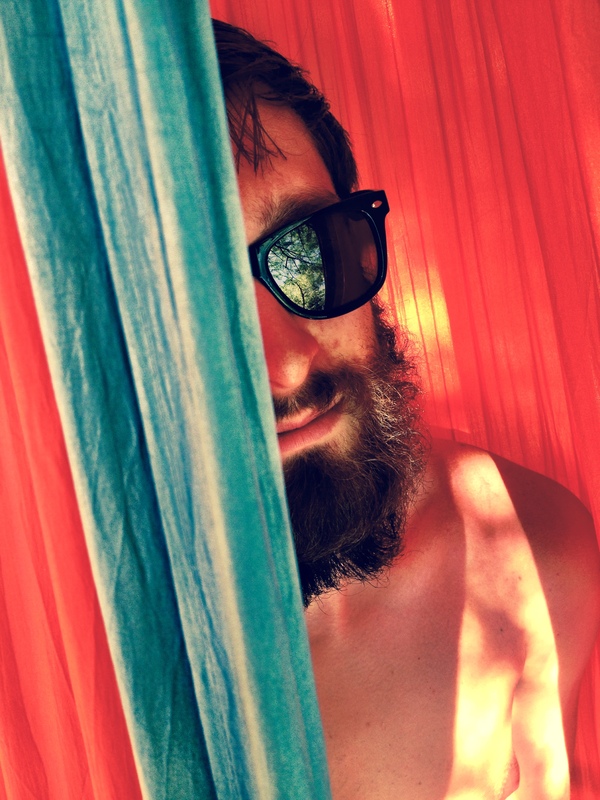 I emailed a few double person hammock brands in hopes to find one to review for my lovely readers here at Appalachian Trials. I am so appreciative to hear back from ENO. I feel obliged to let the truth be known that ENO did provide me with this hammock free of charge. * Whatever is claimed in this gear review, one thing must be known: any brand willing to give me free gear is A-OK in my book! Besides, ENO resides locally near the trail in Ashville, NC and is not a stranger to hiker trash. Seriously, ENO loves the trail so much they even created the DoubleNest Hammock in a special edition ATC (Appalachian Trail Conservancy) version. *Disclaimer: I am not obliged to give this product a good review. I will still write objectively and write exactly as if I would have purchased this item. For further clarity, my other gear reviews have not been from items provided for free. My other reviews are gear I bought with my own money. Since I initially sought out this hammock intended for two people, this review will focus on the ENO DoubleNest Hammock in regards to the couple. Only the hammock and straps will be reviewed, not additional items that might accompany a hammock (such as underquilt, topquilt, fly/tarp, bug net). ENO offers a two year, one time replacement (or repair) warranty for any item faulty for manufacturing defaults. 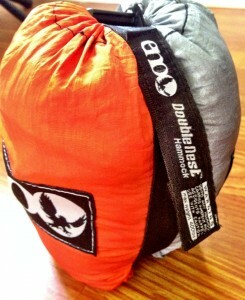 My first impression was positive because of the small, compacted sack the hammock arrived in and the easy set up. The straps were very effective. However, I did have to question if two people could actually sleep effectively together in the hammock. For never having set up a hammock before, the set up was effortless. 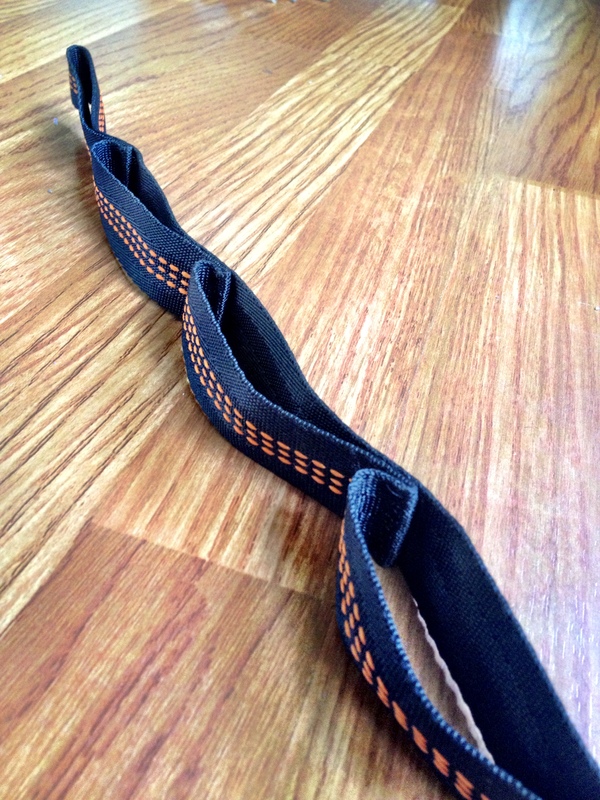 The straps allotted for different widths between trees (or even can be used to set up on a sturdy pole). No fancy knot systems are required. 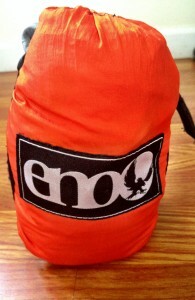 The pack up is also very easy because ENO provides a pouch in which is attached to the hammock to stuff the hammock in. Nice idea for those who lose things like stuff sacks easily. With a 400 pound capacity, the DoubleNest can seat two people without the fear of breaking or ripping. 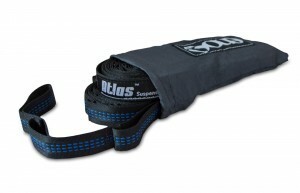 The 400 pound capacity is also perfect for the bigger solo hiker looking for a roomier lay. Even mentioning the word ‘hammock,’ one’s thoughts go to comfort. For a solo hiker, the DoubleNest would provide extra room. For the couple, only sitting would be recommended but sitting side by side would still allow comfort for both. The straps ENO provides are friendly on trees. Also, a hammock does not create an impacted print on the ground like a tent does. Lounging for an afternoon is great but sleeping overnight will not be comfortable for two. We found sitting side by side is the most comfortable. 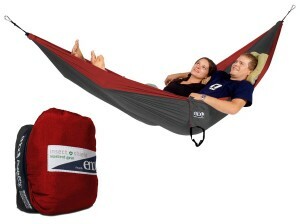 The DoubleNest hammock should not be used for a two person shelter for backpacking. This hammock is perfect for two people to sit side by side but when it comes to laying or sleeping comfortably the DoubleNest does not stand up to this task. 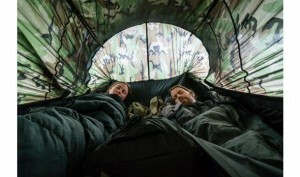 When including hammock, straps, and rain fly, the hammock system is not necessarily lighter than a one-person tent (hammock system weight: 3.3 pounds). 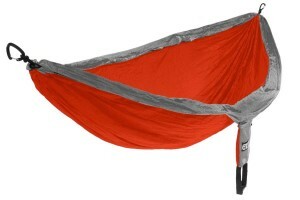 If you are a solo, lightweight hiker, I would recommend ENO’s SingleNest Hammock. *I know I said this review would strictly be considered a couple review for the hammock but I feel this is important to mention. I am not sure if this is a con or not. I might think this should be understood. This hammock is perfect for summer camping but for fall or winter trips you must purchase an under or top quilt for warmth (or even a great sleeping bag) because the nylon material is not heat retaining whatsoever. Based on my own experience, I have rated this hammock on a 1-5 scale, 5 being the best rating. I give comfort a 2.5 if you intended to use this hammock for two people. If you are a solo backpacker, the comfort level would definitely be a 5. I did not give the comfort level a 0 for two people because two people can sit in the hammock comfortably but two people lying and sleeping overnight would not be recommended or enjoyable. I give durability a 4 because of the heavy weight limit and the great warranty. I must admit I have no experience using this hammock for long distances or numerous nights. At first, the material seemed thin and this made me question the strength (the material reminds me of parachute material). However, after laying and sitting in the hammock for long periods of time, I realized the material is strong and lightweight. The triple stitched seams reinforce my decision to designate the quality at a 5. For purchasing just the hammock and straps, the value is pretty great. I think the price is fair for the quality of the item. However, I did not give the value a 5 because all products (hammock, straps, fly, quilts, bug net) must all be purchased separately. We tried to make this work. We tried different positions to find a way to both lay in comfort (spooning, heads on opposite sides, laying between legs, laying side by side). Either way, we were significantly close to each other. Living with Ryan for five months and 22 days on the trail made me extremely qualified in knowing his stinky hiker scent. I would not want to sleep that uncomfortably close to stinky hiker Ryan. However, I will take this hammock to my month long stay in Hawaii for both of us to lounge in on the beach. Sitting side by side is definitely comfortable and doable. This is the ultimate two person hammock. Two separate hammocks are joined together for perfection. The price and the weight aren’t so perfect though. The weight is 6 lbs 4 oz (similar to a not-so-lightweight two person tent). The overall rating is based on the individual ratings above. However, I would not give the DoubleNest Hammock an overall rating of 3.88 out of 5 for using as a backpacking shelter for couples. That rating would be a 0 out of 5 because the inability for both to sleep overnight in comfort. The overall rating below is rated 3.88 out of 5 because the DoubleNest can still be used for two in regards to lounging and sitting. I suspect that the reviewer has not spent much time in a hammock as any true hammock (not TWO hammocks sewn together) by nature puts two people into very close proximity (one mass, actually). Accordingly, I don’t see a lot of value in the review other than to determine that the reviewer doesn’t view a hammock as a good two-person sleep/shelter device.